A lot of the worst rumors following hurricane Katrina in New Orleans were not true. At least some of the examples of police brutality in the aftermath were true. Rumor, misinformation, urban legend: these are all technically different things, but certainly events like Katrina produce a great deal of them all at once. There are many sources online for tracking this sort of thing. 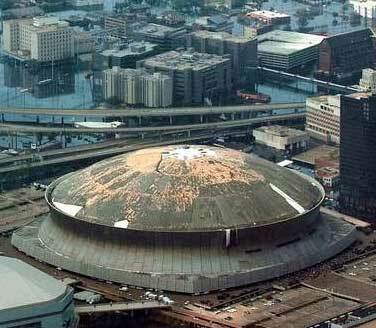 A good place to start might be Barbara and David Mikkelson's Urban Legends Reference Pages, where we find that several of the most popular current rumors deal with Katrina. There is a great deal more to the site, however. Do not neglect the Language section. The paper in question is yet more spinoff from the Intelligent Design controversy. That is, frankly, one of those things like Madonna or rap music that I never saw the point of but that other people go on and on about. The paper itself, of course, is nonsense: you could use this kind of analysis to show that high rates of car ownership cause STDs; or, to flip the argument, that the high incidence of doctoral degrees in the relatively secular northeastern United States contributes to car theft. The most meaningful comparison would be historical. A study of that sort would suggest, probably, that religious revivals correspond to declining levels of social pathology. See, for instance, the historical argument in Gertrude Himmelfarb's The Demoralization of Society. Well over half a billion souls will migrate from farm to city over the space of half a century. As long as China's economic growth continues to produce jobs, guiding the country through this great migration will command the undivided attention of the Chinese government. Except for securing supplies of energy and raw materials, nothing that China might undertake in the sphere of strategic policy will mar or bless this, its principal endeavor. [I]t is pointless to expect new arrivals in Shanghai or Guangzhou to master the political skills that Anglo-Saxons learned over centuries. That leaves a terrible responsibility in the hands of a very few to lead China through a great transition. It cannot be otherwise. America would be better advised to offer practical suggestions, such as how to develop internal capital markets, rather than grandiose and self-serving advice. Spengler, too, thinks that Kant was wrong. He suggests that China's chief problem is to find a metaphysical basis for a new civil society. In any case, I might note that Spengler may be unique in assuming that urbanization will increase stability. [I]t would seem to me more likely that something sudden and convulsive will have rearranged the geopolitical order long before China completes its stately rise to global hegemon. Will the something sudden convulse China? Beats me. We might be in for a nuclear catastrophe in the Indian subcontinent or complete societal breakdown in AIDS-riddled southern Africa. But, on the other hand, if one were looking for a likely candidate for unexpected disaster, a totalitarian state of 1.3 billion people trying to manage an historically unprecedented transformation into the world’s only economically viable form of Communism and with ever-widening disparities between the glittering coastal megalopolises and an impoverished rural backwater — well, that sounds a likely candidate for something goofy...Think of America’s frontier problem with Mexico multiplied a hundredfold and you’ll get a sense of Moscow’s dilemma as 2020 approaches. It signed a temporary agreement with Beijing because it simply can’t afford to enforce that border. In the ever-emptier Russian east there are 16 million people and falling. In China, there are one-and-a-half billion and they need lebensraum. To that, one might remark that Lebensraum will be little on the minds of people who chief desire is to move to Shanghai as soon as may be. Does that mean there will be no 1914-sized discontinuity? By no means.